Sadly, the lethal Muslim reaction to his belated "Burn a Quran Day" (originally scheduled for the already-overplayed 9/11 date), was predictable. Now, much of the Islamic world is up in arms and the death toll of Muslims killing 12 UN workers and guards in violent protest is still rising (source). You know, because "Islam is a religion of peace." Whatever concerns the misguided and xenophobic Pastor Jones holds about "Moslems," adherents to Islam who are moved to kill people after the publication of cartoons or the burning of books merely prove Jones' point ten-fold. As an atheist libertarian spectator from the sidelines of this absurd war of religious dogmatism, it is possible to see a qualitative difference here: no one's natural rights to liberty and legitimately-earned property were violated by fundamentalist Christians burning a Quran or secularist cartoonists drawing the prophet Muhammad. And certainly no one died as a result. Yet instead of peacefully burning American flags or Bibles (both of which are and should remain Constitutionally-protected acts), these Afghanis take it upon themselves to kill anyone they imagine is loosely-connected to a demonstration against their beloved holy book half a world away. it's all good. Now just don't start killing people afterward! U.S. leaders begged Jones not to carry his threats, but the Florida Man of God decided to do it anyway. So last week, in a staged ceremony, he burned a Koran. Now he is party to the murder of 12 innocent people in Afghanistan. Jones has since shown himself to be unrepentant; he insists he did not kill anyone and his Koran burning only proved the point that radicals infect Islam. On that last point, he is right: those in Afghanistan who went off on a murderous rampage had a choice. They could have demonstrated restraint and shown the world that the religion they are so hell-bent on defending is actually one of peace — as we keep being told. They could have reasoned that one man’s stupidity was no excuse for brutality and murder. But they decided someone would have to die for the sake of what Jones did and it really did not matter who paid the price. They are sick and depraved and they will give many the queasy feeling that our young fighting men and women are dying and being injured for nothing. I don’t want to think that way but it’s starting to happen. There is really not much we can do about radical Islam. It can be rooted out, its adherents can be thrown in jail, and a few will end up blowing themselves up. But what do we do about Jones? How in a free society to deal with a man expressing free expression? Legally, there’s probably nothing. Look at the recent U.S. Supreme Court decision to uphold the right of the horrific Westboro Baptist Church, whose member protest at the funerals of U.S. soldiers while they scream “God hates fags.” What do you do about a man like Jones, who represents every instinct that is anathema to the religion he purports to represent, and is a disgrace to anyone with an ounce of dignity? Here’s the answer. Shun him. No longer record a single word he says. Let us will him to disappear into obscurity. Let us hope that even some of the less-cowardly members of his church finally find the guts to reject him. And let us hope that when he finally leaves this earth he will spend an eternity gagging on his own pride and hatred. And his only company will be radical Islamists he tragically inspired. 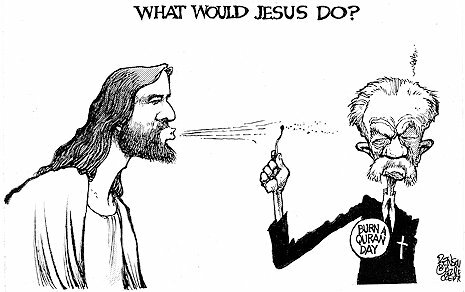 Yes, but what would Muhammad do when Jones actually does burn a Quran? Considering history shows Muhammad to be a violent man, the answer is not promising. Lewis gets it mostly right here. There are no genuine legal "remedies" for demonstrations by Pastor Jones. If his demonstration were to have taken place with only a peaceful response in the Islamic world, Jones would have no argument to stand on. But precisely because widespread religious barbarism has resulted from these actions as with the Danish cartoon scandal before it, Burn a Quran Day shows us all just how urgently the problem of religious dogmatism in the Islamic world needs to be addressed. To this end, Jones is a useful idiot - but to whose cause? Surely these actions will inspire further militant resistance from Taliban forces in Afghanistan (as if having your country bombed and occupied by the U.S. military for the past decade wasn't enough already). But here in the United States, it would seem to me that religious fundamentalists have, as of late, been the strongest proponents for upholding our eroding civil liberties. As with last month's Supreme Court ruling in favor of the Westboro Baptist Church's right to be bigoted homophobes in public (source), the Dove World Outreach Center has made clear to the world that the United States still upholds the right to assemble and speak freely - even offensively. Indeed, since we have every reason to believe that Pastor Jones is sincere in his convictions about Jesus Christ as the one true savior and Islam being of the devil, we deserve the right to hear Jones' perspective moreso than the ecumenical liberals who would have us believe that all religions essentially teach the same thing and do so equally well (a claim shown to be patently false by the ensuing Islamic violence after Burn a Quran Day). For these reasons, Jones' misguided efforts must be defended, if not for their content at least for their form.